For the first time, scientists have captured on video what happens when stem cells are born. Now they know where blood-making stem cells form in the body, and what the process looks like. Their research could help with leukemia therapies. 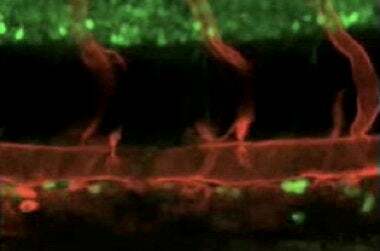 Scientists at UC San Diego filmed stem cell generation in zebrafish embryos, and discovered that the cells emerged from the dorsal aorta, a blood vessel that forms early in embryo development. In this video, you can see the stem cells slowly peeling away from the wall of the dorsal aorta, plumping up, and turning green (the biologists tagged stem cell genes with fluorescent markers to make the cells easy to spot). While there is something essentially cool about witnessing the birth of stem cells, the research team conducted their experiment to improve therapies for leukemia and other diseases of the blood or bone marrow (blood-making stem cells reside in your bone marrow). Knowing how blood-making stem cells form is the first step toward growing them in the lab. In a disease like leukemia, patients receive bone marrow transplants, but often suffer when their bodies reject the donor tissue. If doctors could use the patient's own blood or genetic material to grow new stem cells, they could build the perfect bone marrow transplant. They'd essentially transplant the patient's own (transformed) tissue back into the patient. The problem with rejection would solved, and bone marrow transplants would be a much less risky proposition.